The VOX Showroom - Vox Vox amPlug2 Cabinet - 2014-2019? 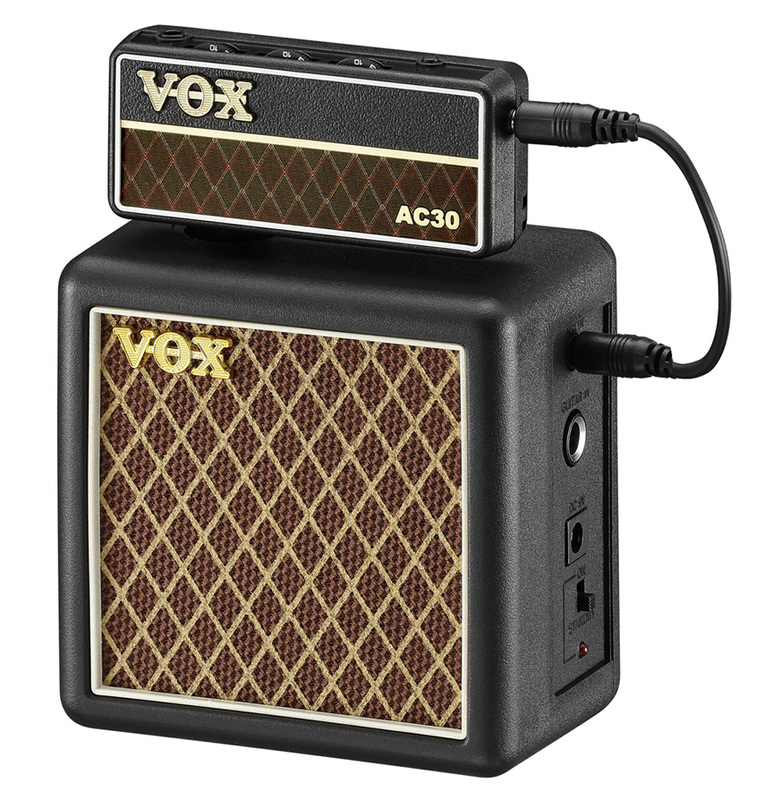 The Vox amPlug2 series included seven compact head phone amplifiers for guitar or bass designed to plug into the input jack of an instrument. Each amPlug2 combined a unique analog amp modeling circuit with digital effects such as chorus, reverb and delay. This allowed the amPlug2 to deliver the tone of many of the world's most iconic amplifiers to the privacy of a set of headphones. 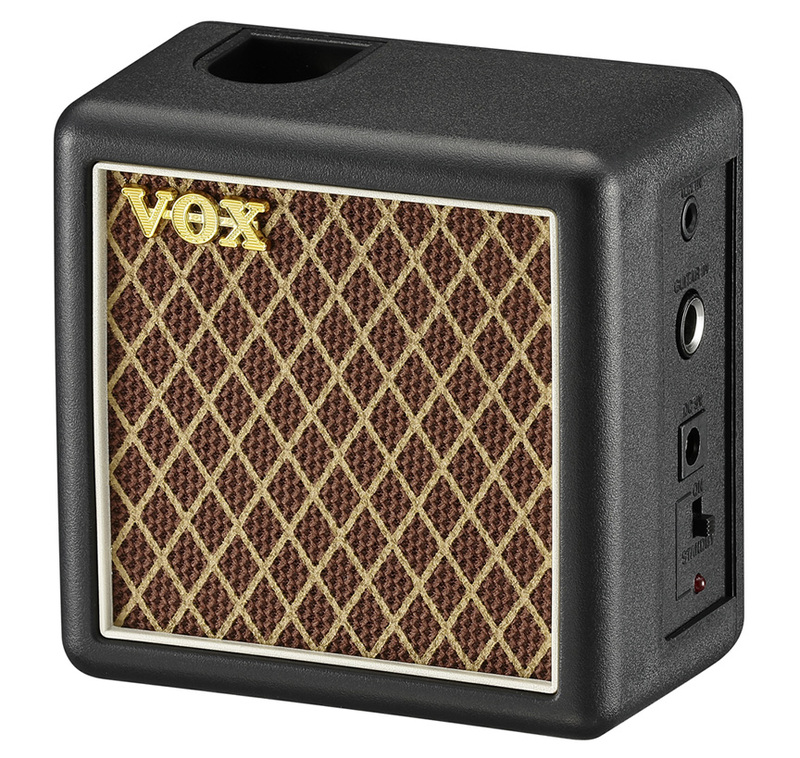 Vox introduced the battery operated amPlug2 powered speaker cabinet (shown at left) as an amPlug2 accessory in 2015. The amPlug2 powered speaker cabinet featured an injection molded plastic case faced with traditional brown diamond pattern grill. Combining an amPlug2 powered speaker cabinet with an amPlug or amplug2 headphone amplifier created a 2 watt "mini stack" practice amp. Set up couldn't be simpler. A ¼" jack on the top of the amPlug2 powered speaker cabinet accepted the plug from the amPlug or amPlug2 headphone amplifier. A removable cable with ⅛" plugs connected the powered speaker cabinet to the amPlug headphone jack. A ¼" input jack on the right side of the amPlug2 powered speaker accepted the cable from the instrument. A large variety of amp models and tones were available by swapping out different amPlug headphone amplifiers.